Heated Driver Seat, Back-Up Camera, Satellite Radio, iPod/MP3 Input, CD Player, Onboard Communications System, Aluminum Wheels, Remote Engine Start, Dual Zone A/C, WiFi Hotspot, Heated Seats. MP3 Player, Keyless Entry, Steering Wheel Controls, Child Safety Locks, Electronic Stability Control. ENGINE: 2.0L EcoBoost® GTDI I-4 (STD), TRANSMISSION: 6-SPEED SELECTSHIFT AUTOMATIC paddle shifters (STD). Lincoln with Guard Metallic exterior and Ebony interior features a 4 Cylinder Engine with 240 HP at 5500 RPM*. PowerLife Limited Lifetime Warranty. Edmunds.com's review says "Something you might not expect from the Lincoln MKZ is its composure when going around turns. The standard adjustable suspension and quick steering make the Lincoln MKZ feel more alert than any other Lincoln in recent memory.". Great Gas Mileage: 33 MPG Hwy. One of the largest luxury dealer groups in the world. Our purchasing power and large inventories help ensure great deals. Large children's play area. Complimentary work stations and wifi. All figures are EPA estimates. Actual mileage will vary. Kelly Blue Book values are calculated based on the current Retail Book. Horsepower calculations based on trim engine configuration. Fuel economy calculations based on original manufacturer data for trim engine configuration. Please confirm the accuracy of the included equipment by calling us prior to purchase. The amount shown as MSRP is for informational purposes only and is the Manufacturer’s Suggested Retail Price. This amount does not represent an advertised or selling price and does not include the price of any dealer added equipment. All advertised prices exclude government fees and taxes, any finance charges, any dealer document processing charge, any electronic filing charge and any emission testing charge. Colors, options and trim levels may vary. Not responsible for typographical errors. Specifications, features, safety and warranty data are based on what is available as standard specs/features per trim level, for the designated model-year, and may not apply to vehicles with added packages or options. See dealer for written warranty information. Dealer makes no guarantees or warranties, either expressly or implied, with respect to the accuracy of any data listed on this page which was obtained from third party sources. All specifications, equipment and information are subject to change without notice. Any information contained on this page should be used for informational purposes only. Galpin’s internet advertising is intended only for persons in California. All advertised prices exclude government fees and taxes, any finance charges, any dealer document processing charge, any electronic filing charge and any emission testing charge. Not responsible for typographical errors. Prices valid through today’s close of business. Subject to prior sale. Any information contained on this page should be used for informational purposes only. Galpin’s internet advertising is intended only for persons in California. Notice All of Galpin Hondas used vehicles have an active theft deterrent device installed. This advertised price excludes the purchase price of the optional theft deterrent device which can be (1) purchased for an additional cost or (2) deactivated at the time of sale. If the device is deactivated it will be a non-functional item and at no time will it be activated. *Limited Lifetime Powertrain Warranty is non-transferable. Terms and conditions apply. Must perform manufacturer recommended maintenance and have oil and filter change completed at a minimum of every six months or 7,500 miles, whichever comes first. All services must be performed at a licensed repair facility. Eligible vehicle must be a 2008 – 2017 model-year vehicle and have less than 100,000 miles at the time of sale. Excludes vehicles covered under a manufacturer certified pre-owned (CPO) program warranty. Additional exclusions apply. Offer valid through close of business December 31, 2019. 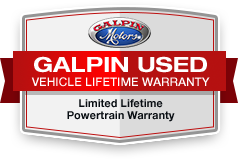 See Galpin.com for a copy of the limited powertrain warranty and full exclusions. Copyright © 2019 Galpin Volkswagen. All rights reserved.